I participated in Lori's (Humble Quilts) doll quilt swap and look at the wonderful quilt I received all the way from England. Thank you Frances (Fabadashery) it is stunning. 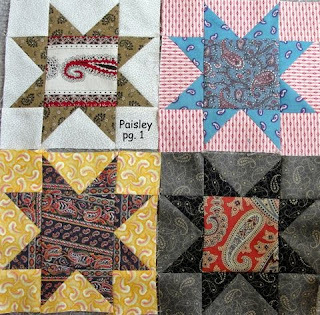 When I opened it and noticed all the wonderful hand quilting, I just couldn't believe it. 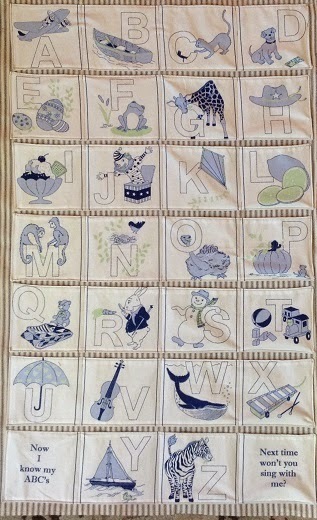 Then as I looked closer I noticed it was all hand English pieced as well. Simply beautiful. I am a lucky one. and Frances sent me this adorable little Bear Paw pin as well. So sweet. I will post the one I made as soon as I know it has arrived at its destination. I sent it to Washington state on Tuesday. 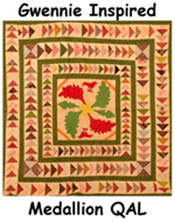 I am looking forward to the link up (if I can figure it out) after all quilts are in to see all the other wonderful treasures. Thanks Lori for hosting such a fun party! At the risk of making this post too long I would like to show you some Time Warp stars from friends with no Blogs. First my friend Tina has caught up nicely. What a collection! and here are Karen's latest. She is really going crazy. 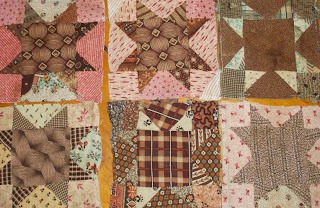 Karen and Tina are part of a group of seven of us who meet every June for a 3 day quilt retreat. I think the three of us will be sharing our stars! but remain in our hearts forever. 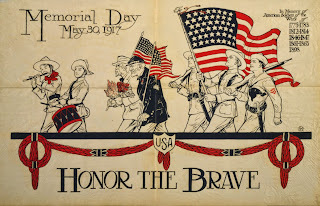 After reading some of the comments left by you wonderful Bloggers yesterday, I went back and re-read what I had posted. I think it may have sounded a little cynical. My intention was to express my feeling of when something bad happens you can (almost) always find something to lift you up. 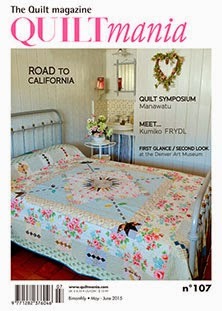 I was so excited about being in Quiltmania, that I fear I gave the wrong impression about my feelings toward AQS. I have been honored to have been accepted in many AQS shows and will certainly continue to enter them and I encourage all of you to do the same. It is one of the best ways we share our wonderful art with the world! 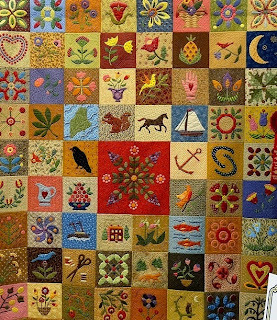 O.K., Spring in the boatyard (where I work) doesn’t leave much time for quilting. 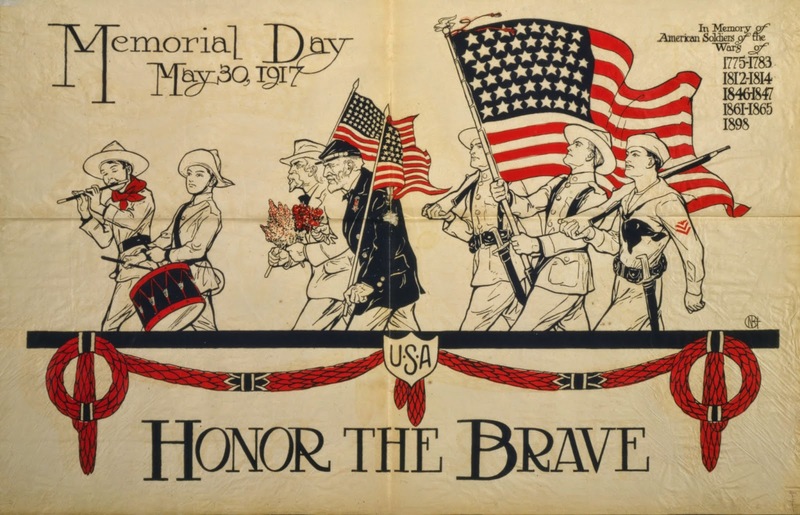 In fact, it is Tuesday and I haven’t made my California Gold stars yet. 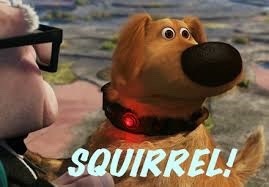 But, my friend Karen has and here they are. Don’t you love the radiance of that blue with the gold? I did find a little time to whip up something for my grandson. He goes to a special school for children with autism and when I picked him up last week I noticed a piece hanging on the wall that held plastic coated letters. He loves his alphabet flash cards so I said “I can make that”. 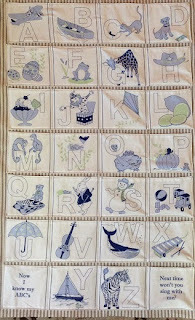 I bought a panel with the alphabet on it and cut it up into strips and sewed them to a background so he can place his letters in the correct slots. It is no prize winner, but he will love it! Thanks for your great comments and encouragement yesterday! And another one bursts open! I'm sure you are all sick of seeing this quilt by now, but it does go with my title story. I received an e-mail from AQS that my quilt was not accepted into the Syracuse show. Now I always tell people that you have to have a very thick skin if you want to enter shows and take the good with the bad. 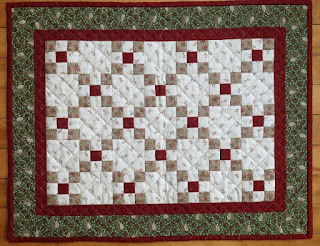 Long story short, the very next day, I got an e-mail from a Blogging friend (Mayleen at Q is for Quilt ) who said she saw my quilt in the latest "Quiltmania" . Wow!! This is my all time favorite magazine. I don't subscribe because I get it from my favorite quilt shop, Busy Thimble, and I will be picking it up as soon as I can!! So... you just never know. Quilt judging is very subjective. 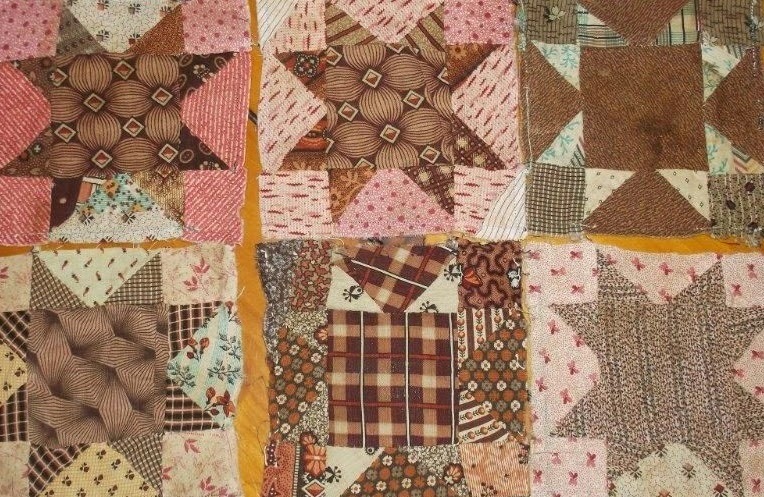 I used to feel I couldn't enter my quilts in shows that were predominantly machine made or that featured "modern" quilts. 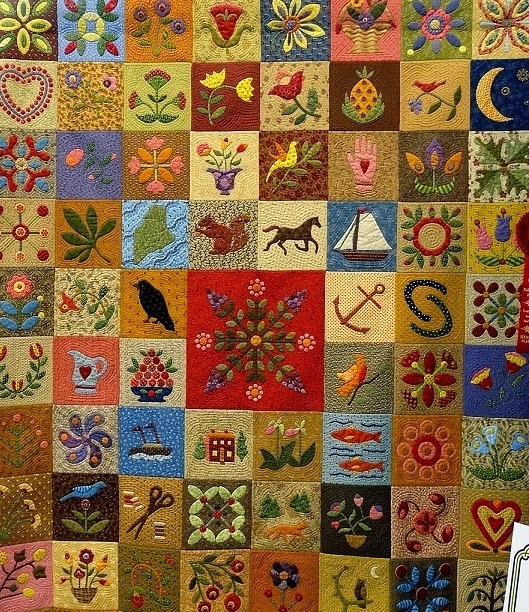 But, I truly feel that quilts are quilts and that when I go to a show, I want to see all of them! 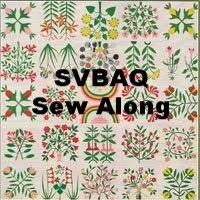 I want to know what other quilters are doing. 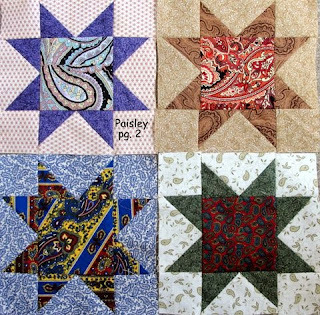 I know I will always be hopelessly traditional and my goal in my quilting life is to keep that tradition alive. But, as with everything in life, there is room for the old and the new and we can learn from both. So, go enter a quilt! I am so happy that I started Blogging. I have learned so much, met new virtual friends and have been inspired more than I probably should have! But I am also fortunate to have many non Blogging friends who inspire me as well. 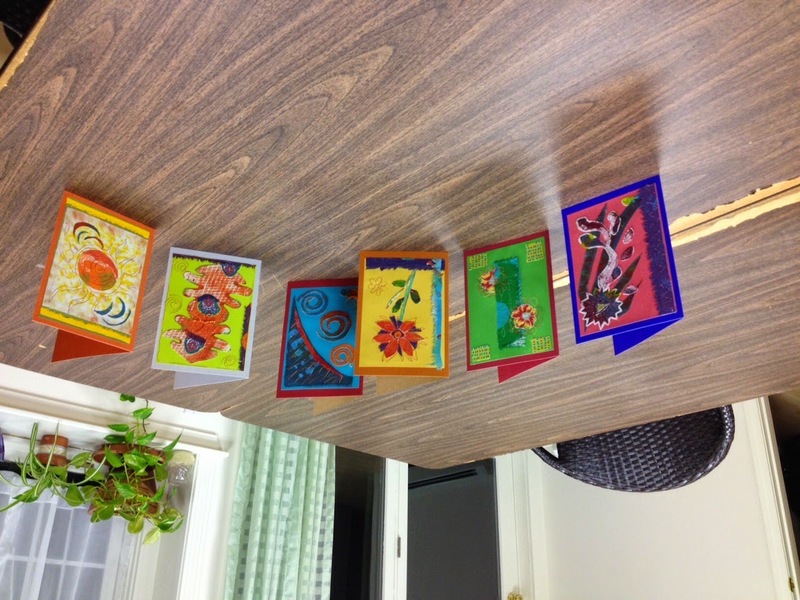 Here are some beautiful note cards that my friend Tina made from her hand painted fabrics. Sensational! Argh! I can't seem to get them right side up. Hope you are viewing this on a lightweight mobile device, otherwise just stand on your head. It is good for circulation. And, here are my friend Karen's Time Warp stars with those fabulous conversationals. Aren't they wonderful? And as my friend Cyndi (Busy Thimble) says, they are like peanuts, you can't stop at one! So, as they say "make new friends , but keep the old, one is silver and the other gold. My father always said I had the "gift of gab". I could talk him into anything before he even knew what hit him. I guess that is why I love the "conversational" prints so much! I have been collecting them for years. Here are my Time Warp stars for week #17. 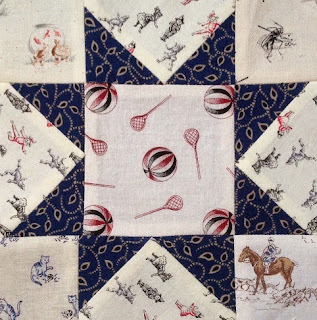 The cricket playing pool is one of my favorites. And, of course I like any print with a horse on it! The piece with the jockey wearing a horseshoe is an exact reproduction of an antique piece I have. 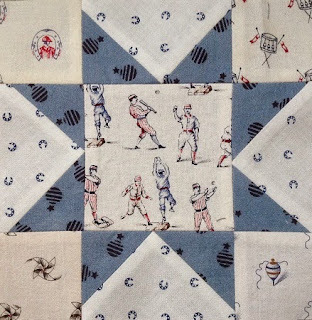 The blue in this is from Barbara Brackman's Union Blues line from Moda. Love those blues! Have fun with your time warps this week. I hope you all had a wonderful Mother's Day. I certainly did. I enjoyed a wonderful breakfast at my daughter's house. I played with my grandson while everyone worked! Then I cam home and began a major clean out. Not the boring kind of "maintenance" cleaning, but a giant purge of unwanted items that makes you feel great. The impetus was to move books from my upstairs hall to make way for new quilting books and magazines. I was so happy with the results that I found the energy to tackle the bookcase under the stairs as well. And, I contributed lots of good books to a friend with a second hand bookstore. So... everyone had a very happy day! Do you see the space I have created for "more"!! I was able to free up a bit of space in my lawyer's cases as well. This will be filled this week when I sort through some of the magazines that have been piling up in my sewing room. This represents only half of my quilt book collection. My next project is to index them all so I don't have to spend two hours looking for a book when I need it. Of course poring through any book is fun, even if it wasn't the one you intended to find! Hope you all get a little book time today. I never seem to make it, but I have fun trying! Here are the (week 14) Rainbow Ombre stars. I noticed the ombred parts were mostly cutoff in the end, but just picture them as the beautiful prints they once were. Week 15 - "woven plaids. These are those wonderful Roberta Hortons from the 1990's. Fabulous light and airy feel to them. I love working with these. 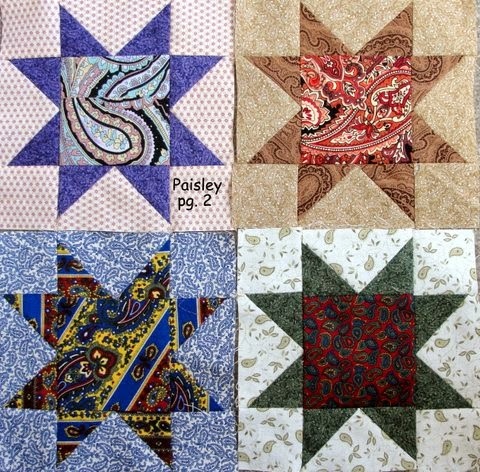 and last week's "paisley" stars. I may fall short on the color (mis) placement, but I excel in the point cutting off department! and her paiselys which, apparently are her favorite! Didn't she do a wonderful job? I must get her to start a blog!! And, although I said when I first started this blog that I would keep it to "quilt" related subjects only. I just have to brag for one second about my wonderful grandson completing his first ever road race (first one for Nana too). My DIL had organized a group of over 30 people for our "Team Caton" in a walk for autism awareness this past weekend. 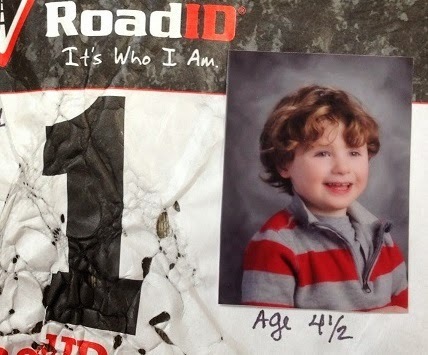 We all had doubts as to how long he would last, but he made the entire 5K trip in the stroller (believe me this is not easy for a child with autism!) and was a trooper all the way. Good job buddy! You are #1 with us too! Sorry for the bad photo but I didn't want to wake my husband up this morning to hold it up and I don't have the sleeve on yet. Nine months to the day ,start to finish, just like a "real" baby. I set this goal because I have such a short attention span that I knew I would never finish it if I couldn't complete it within a year. Debra (Life is a Stitch) asked me how I liked the process and if I would change anything about it? Hmmm... I love the process itself. Fun and portable. I love the way the back comes out with each individual block having its own fabric. Of course I did change the borders by simply appliqueing circles instead of the pieced borders, but I love how it turned out. 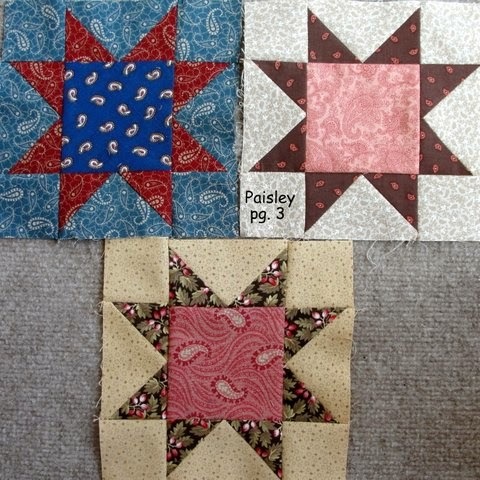 I would change the cone shaped border pieces by measuring them separately. I think I may have to fix one or two of them now as I seem to have a slight ripple along two borders. Hopefully it will be an easy fix. As they say... "measure twice, cut once". I would also change to all hand quilted. I began machine quilting a few of the ones with really tiny pieces and now I am too lazy to take them out. 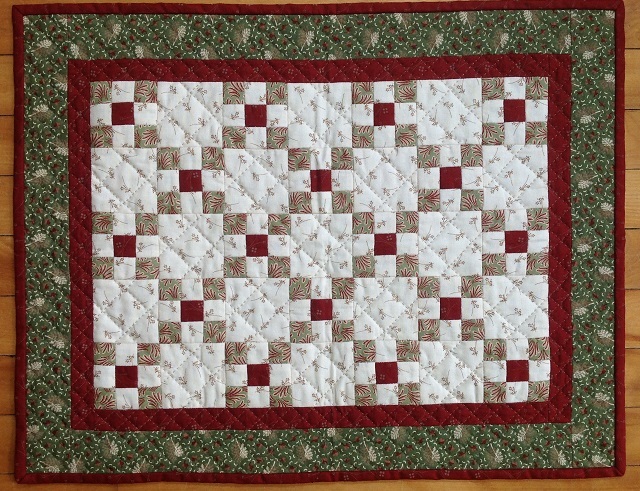 It is 90 % hand quilted so I'm not going to worry about it, but if I do it again - what???? never mind. The corner blocks came out just fine - after that measurement disaster. 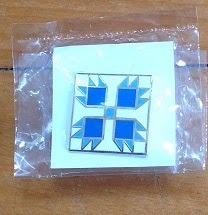 I will put a label on the back with much more detail. I wanted the corner blocks to have simply sayings. Overall I am very happy with it. 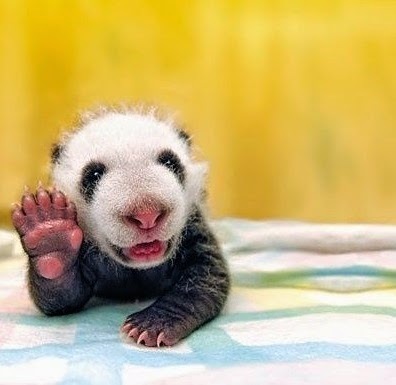 I can't thank all of my Blog readers enough for all the supportive comments and encouragement to carry on. You are all the best!! I am so glad I started Blogging. Now I can't wait to start the next potholder. "Dutch Oven". Stay tuned.